Manual override ON/OFF switch. Grounded, compact 6 inch cord. Maximum ON Time: 8 hours. Minimum ON Time: 2 hours. Timer Functions: Turns on electrical load at dusk off at timed settings. 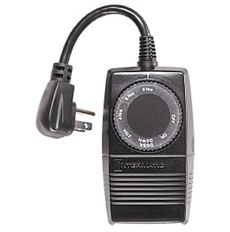 8.3 Amps, 1000 Watts Resistive; 8.3 Amps, 1000 Watts Tungsten, 120 V.A.C. Operating Temperature: -35°C to +40°C.